The Luckyday Retreat is held a week prior to the beginning of classes at the university. All Luckyday freshmen scholars are required to attend the annual retreat. While at the retreat, Luckyday Scholars learn about their responsibilities as Luckyday Scholars, participate in team building activities, listen to speakers on important topics related to their adjustment to college and build a network of friends prior to stepping foot in the classroom. Are we really going to camp? Educational-Resource Programming: Educational-resource programming is focused on achieving academic excellence. The goal of this programming is to reinforce available campus resource information to aid in the enhancement of learning. This information will be reiterated to ensure that the Luckyday Scholars clearly understand the campus resources, technologies and services that will aid their academic progress and success. 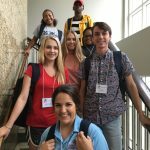 Life and Career-Assessment Programming: Life and career-planning programs help Luckyday Scholars consider how to gain personal satisfaction and find enrichment in their lives after their Luckyday experience. Luckyday Scholars are encouraged to assess their interests and abilities, as well as their strengths and weaknesses, and to make choices based on these assessments. Throughout your time in Luckyday we will discuss your interests and provide resources for you to navigate towards fulfilling your desired career goals. Service and Community Partnerships: The focus of Service and Community Partnerships is to help Luckyday Scholars understand their place in the larger community and to connect students to these initiatives campus and community-wide. Specific Luckyday partners include: Crenshaw Elementary School in Crenshaw, MS, Green Hill Elementary School in Sardis, MS, Como Elementary School in Como, MS, Springfield Missionary Baptist Church in Abbeville, MS, Oxford-Lafayette Habitat for Humanity and Strawberry Plains Audubon Center in Holly Springs, MS.
Social Programming: Social programs provide the opportunity for Luckyday Scholars to interact with one another in a fun and relaxed atmosphere. As a result, Luckyday Scholars will feel a part of a larger group/community, have a better college/first-year experience and take pride in the program. Social programs, though emphasized in the fall and at the beginning of the semester, will take place throughout the entire year.